For Victorian deliveries, we deliver between 7am-3pm Monday to Friday (this is dependent upon traffic and other conditions). Deliveries can also sometimes be arranged on Saturdays between 10am-3pm (this is dependent upon traffic and other conditions; weekend surcharges may apply). Once you have placed your order you will need to arrange a delivery time and we will advise you of the delivery charges applicable. For interstate orders, a courier or freight company will be used. We will call within 2 business days of your order being placed to arrange a date of dispatch from our warehouse and advise you of the shipping charges applicable. Unfortunately, we are not be able to guarantee an exact date or time of delivery for interstate orders. We can generally hold orders for up to 12 months (for example, if you are just starting to build and don’t want to miss out on a bargain). You are required to pay our standard minimum 20% deposit to secure your stock, with the balance payable in full prior to dispatch from our warehouse. We do not charge additional storage fees for holding orders for up to 12 months. If you need us to store your order for longer than 12 months, additional charges may apply. We must have a street address for any order submitted. We cannot ship to P.O. boxes. Unless you request that an "Authority to Leave" instruction be given, we will require a signature at the point of delivery. It is therefore a requirement that you provide Timber Flooring Clearance Centre with a delivery address where someone will be present to sign for the consignment during delivery hours (please see above under "Delivery Costs and Times"). 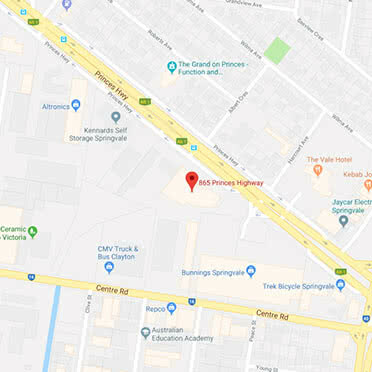 When you purchase online you have the option to pick your goods up from our store at 865 Princes Highway, Springvale VIC 3171. We will notify you when your goods are available for collection. Whilst we endeavour to have someone here to help you load this isn’t always possible and you may need to load the goods yourself. Flooring comes in long, heavy boxes and typically does not fit in cars and will require a trailer, ute, van or similar. We suggest you measure your vehicle and/or trailer and check weight limits before choosing this option. As third party carriers are used for interstate orders, insurance does not form part of the quoted cost. If you would like to insure your goods during transit, you will need to request this by calling (03) 9546 9076 after placing your order. If any goods appear to have been damaged in transit and it is apparent when they arrive please REFUSE the delivery and contact us immediately on (03) 9546 9076. If you have already accepted delivery of your goods and then discover that they appear to have arrived damaged, you must contact us within 24 hours of delivery. If possible please take photos of the damaged goods. Outside of 24 hours after the time of delivery we cannot be held liable for any damage to goods you have accepted. This does not infer that we are necessarily liable for any damage to goods in transit from us to you, whether accepted by you or not. If you receive defective goods please call Timber Flooring Clearance Centre on the above number for return instructions.